Made with tomatoes & red wine. 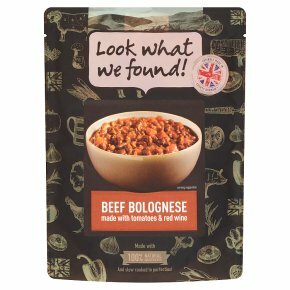 Made with 100% natural ingredients and slow cooked to perfection!. British meat locally sourced. 255 cals per portion. Gluten free.The best locally sourced ingredients, slowly cooked to absorb all of the delicious flavours..... a perfect result! Tasty Meal Ideas Delicious with spaghetti and a sprinkle of Grana Padano. Warning: Pouch and contents will be hot following heating. Cut off top of pouch.Heat in microwave (category E - 850W) for 2 minutes or until hot.Stand for 1 minute. Stir and serve... enjoy! Empty contents into saucepan. Heat gently and stir occasionally.